Part of the fundamental magic of Automation, is its inherent ability to express the data contained in one application, in a different way in another application. What would normally be an intricate laborious process when done by hand, is reduced to a quick effortless operation through AppleScript’s ability to control and link the targeted applications. 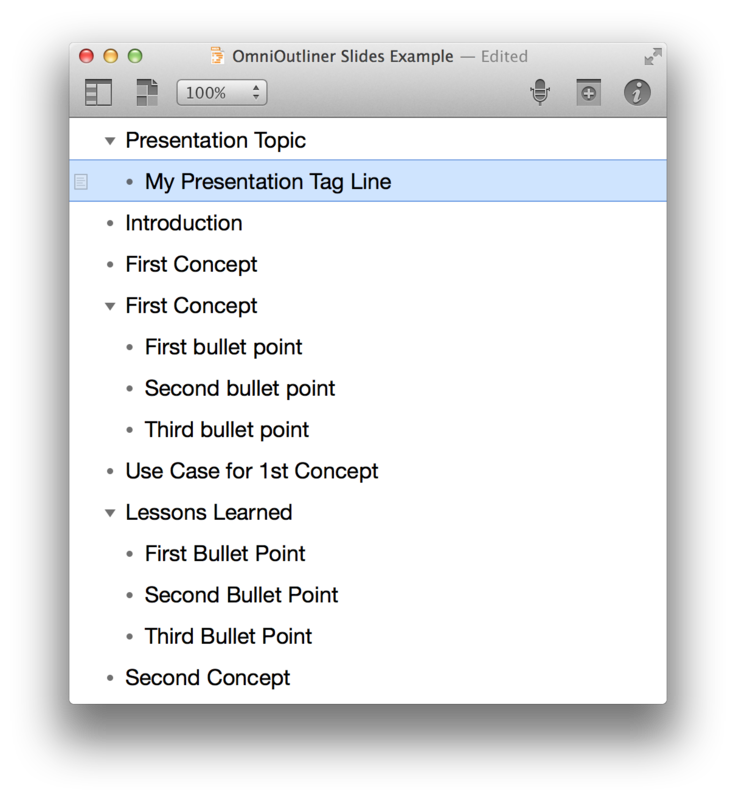 The following example script demonstrates these concepts perfectly as it builds a Keynote document from an OmniOutliner outline document. DO THIS ►DOWNLOAD and open the OmniOutliner example document. DO THIS ►Open the example script (⬇ see below ) in the AppleScript Editor, and save the script into the OmniOutliner scripts folder. DO THIS ►With the example document open in OmniOutliner, select the saved script from the Script Menu. The script will create a new Keynote document and add a slide, with transitions, for each of the outline sections, filling in titles and body content as indicated. Once the document is created, the presentation will be played from the beginning, and auto-advanced throughout. English-German "Title - Center" "Titel - Mitte"
English-German "Title & Subtitle" "Titel & Untertitel"
English-German "Title & Bullets" "Titel & Aufzählung"
English-Norwegian "Title - Center" "Tittel – sentrert"
English-Norwegian "Title & Subtitle" "Tittel og undertittel"
English-Norwegian "Title & Bullets" "Tittel og punkttegn"
English-Japanese "Title - Center" "タイトル（中央）"
English-Japanese "Title & Subtitle" "タイトル & サブタイトル"
English-Japanese "Title & Bullets" "タイトル & 箇条書き"
29 set dialogMessage to "Standard Size or Widescreen?" 64 set the masterSlideName to "Title - Center"
66 set thisSlideBody to ""
68 set the masterSlideName to "Title & Subtitle"
72 set the masterSlideName to "Title & Bullets"
77 set AppleScript's text item delimiters to ""